The building of the North Gallery extension heralded the end of the outside ‘kharsi’’ which everyone dreaded using! 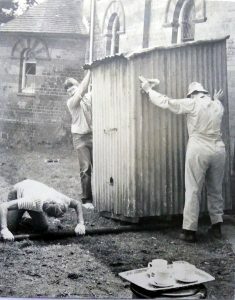 The outside corrugated iron cubicle met its end and is seen being removed by members. This entry was posted in Snippets on March 19, 2018 by Peter Bishop.